A spiritual healer has claimed he can get David Beckham fit "within three days" despite medical experts ruling him out of action for around six months. The former England captain saw his World Cup hopes ruined earlier this month when he ruptured his Achilles tendon on AC Milan duty. Sri Lanka president Mahinda Rajapakse has offered Beckham his personal physician, Dr Eliyantha Lindsay White, who claims he can get Beckham back on the pitch in time for the finals in South Africa. "I am ready to treat him," Eliyantha Lindsay White told AFP. "His condition can be easily treated and within three days he will be able to go back to playing. His case is simple. I can treat him. He can play again." 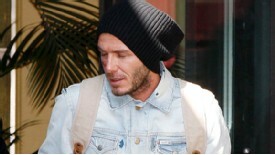 Beckham has been invited to travel to Sri Lanka for treatment. Dr White recently received praise from Indian cricketer Sachin Tendulkar after treatment on a knee injury. Manchester United failed to build on an early lead in their Champions League quarter-final against Bayern Munich, going down 2-1 in the Allianz Arena. United got off to the best possible start with a goal after just 66 seconds when Wayne Rooney was left unmarked to volley in Nani's free-kick from close range. But the visitor’s failed to build on this early strike and Munich gradually began to impose themselves on an increasingly nervous looking Reds rearguard. Franck Ribery, who gave Gary Neville a hard time, levelled with 13 minutes remaining when his free kick took a deflection off Rooney past Edwin Van der Sar . 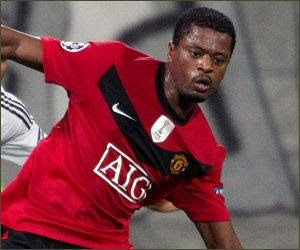 United then appeared to be hanging on for a draw until Patrice Evra was caught in possession in the final minute by Ivica Olic who raced clear to score. Sir Alex Ferguson’s misery was compounded by Rooney then limping off with an ankle injury with only an away goal being a crumb of comfort on a disappointing night for the Old Trafford outfit. 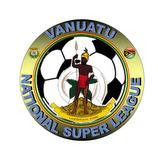 The Vanuatu National Soccer League (NSL) that was set to kick-off this Saturday 3rd April 2010 is now postponed till further notice. Port Vila Football Association President, Mr. Robert Calvo reported to Vanuafoot that a PVFA meeting decision today has postponed the NSL, awaiting OFC's decision pertaining to Tafea F.C. Vs Lautoka F.C. case. OFC disciplinary committee have taken up the Tafea F.C. Vs Lautoka F.C. case and have yet to reach a verdict. 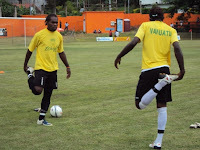 Vanuatu NSL is a new football tournament established to find the best local club to represent Vanuatu in the O-League. Despite the events that caused misery to the nation, Tafea F.C. is the only club that have been representing Vanuatu in the O-League, and they made history when they reached the finals in 2001 in PNG, but loss to Wollongong Wolves by 1 goals to nil. Vanuatu says 'Sorry' to Lautoka F.C. 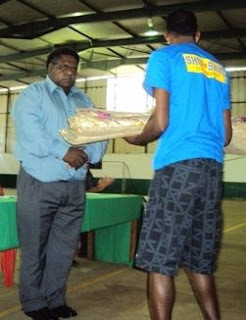 In a ceremony organized this today 30th March 2010 by the Ministry of Youth and Sports at the Port Vila Ex-FOL house, the Minister responsible for Youth and Sports, Honorable Raphael Worwor reconciled with the Lautoka F.C. and Fiji Honorary Consul over the incident that happened last weekend at the PVM Stadium. Last weekend match between Tafea F.C. and Lautoka F.C. was brought to chaos after some spectators stormed the pitch few minutes before the end of match and caused the game to stop. During the ceremony, Honorable Raphael Worwor states the government position on the incident and conveyed Vanuatu’s apology to players and management of Fiji Lautoka team. “Vanuatu and Fiji have established and built a very strong relationship through exchanges and support in regional and international dialogues and worked together to establish regional institutions as the University of the South Pacific, Forum Secretariat, Secretariat of the South Pacific Community and the Melanesian Spearhead Group, to name a view”, said Minister Worwor. "As appropriate measures will be taking course, the government finds it proper as Melanesian brothers and also as the host country of this important match to officially in this occasion convey on behalf of the government football family, VFF and people of Vanuatu our deepest words of apology and sorry. Minister Worwor also stressed that the government is seriously concerned as these attitudes do not promote sports and in particular soccer development in the region. “The actions can also lead to degradation of relationship build so far between the two countries”, he stressed. The Minister also made an appeal to organizers and in particular VFF to ensure a more tight level of security are in place in the future for important regional and international matches such as this one. Should fans have the right to buy into their clubs? Interesting story in the Guardian this morning, saying Britain’s Labour government, if re-elected, are ready to unleash plans to give fans the right to buy their clubs when they come up for sale, and to insist that current club owners give up a stake as high as 25 percent to their supporters. If we can leave the politics aside (there is an election on the way, and the opposition Conservatives have said acting now, after 13 years in power, makes it a pre-vote gimmick) do you think this is a good idea? It comes after the high-profile Liverpool campaign to get 100,000 fans of the club to raise 500 million pounds in a “Barcelona style” member share scheme, and more recently the Red Knights proposal of a buy-out of Manchester United from a smaller group of wealthy individuals. This latest proposal,as reported, seems to be acceptanace that football is not just a business, and would presumably make club ownership less attractive for anyone wanting to get involved just to make a profit. Certainly, giving fans the opportunity to take on a quarter stake, and with it a big say in the running of the club, sounds a radical idea in the current era of leveraged buy-outs and PIK notes. Similarly, giving fans time and persumably the help they would need to put together a full takeover bid whenever a club goes up for sale also seems a world away from the laissez-faire capitalism we’ve had of late. Other countries, notably Spain and Germany, cherish their models of full or part fan ownership, even if neither is without its problems (consider the heavy debts Real Madrid and Barcelona have had in the recent past and the inability of carefully run Bundesliga clubs to compete for top-draw players with Spain or England). More caution in terms of strategy and more modesty when it comes to expectations might be attractive to a lot of English football fans bruised by rising ticket prices and left wondering why so much money is being spent on loan interest payments. And if it means the end of Premier League teams monopolising the Champions League knock-out phase, would that be a price worth paying? 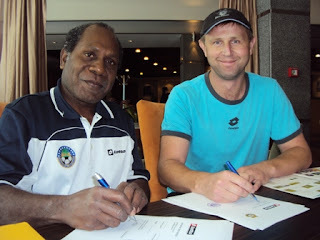 Vanuatu Football Federation signed a partnership contract with Score Sportswear, agent of popular label Lotto, of New Zealand. The signing took place at Ibis Hotel in Auckland on the 13th of March early this month between VFF President, Mr. Lambert Maltock and Mr. Blair Dawkins who is the managing director of Score Sportswear in New Zealand. The agreement will allow VFF to purchase Lotto football apparel with Score Sportswear at a lower price, and Mr. Maltock has extended the invitation to interested clubs in Vanuatu to make arrangements through VFF. The agreement is a 1-year contract and can be renewed the following year. Lotto is a popular label by an Italian sports apparel manufacturer established in 1973 by the Caberlotto family. Their products are now distributed in more than 60 countries. Papua New Guinea’s Hekari United FC are the first team through to the 2010 O-League final after they beat Marist FC 4-1 at Lawson Tama Stadium in Honiara on Saturday afternoon to claim top spot in Group B. The other finalist will be determined tomorrow when Auckland City meet Waitakere United in the Group A decider at Kiwitea Street, with Waitakere needing only a draw to claim top spot while Auckland need the win. It was the imports who starred for Hekari today with goals coming from Fijian Pita Bolatoga and Solomon Islanders Henry Fa'arodo and Alick Maemae, who claimed two. Qualification for the final comes as just reward for the Papua New Guinea club champions after they finished one point behind 2009 finalists Koloale in Group B last season. Meanwhile, Marist could only manage a consolation goal in the 78th minute through Commins Menapi and finished bottom of the group with one point from six matches. In today’s other Group B match, Lautoka picked up three points with a 3-1 win over Tafea in Port Vila but the Fijians had to settle for second spot, just one point behind Hekari. The first leg of the final will be played on Saturday 17 April with the return leg scheduled for Sunday 2 May. Former England manager Sven-Goran Eriksson has been appointed Ivory Coast boss for the World Cup this summer. Eriksson, who has been out of work since leaving his role as director of football at Notts County in February, had recently been interviewed for the Nigeria job but lost out to fellow Swede Lars Lagerback. However, Eriksson was viewed as the best candidate for Ivory Coast after Russia boss Guus Hiddink decided to take the Turkey job. Outtara Hego, secretary general at the Ivory Coast football federation, said: "Eriksson signed a contract in London on Sunday. "As most people know, Guus Hiddink was our first choice. When that did not happen, Eriksson was the best alternative. He has the necessary experience." Eriksson's agent, Athole Still, told Soccernet on Sunday night: "Sven is here sitting beside me having just signed the contract and I can tell you he is very happy. "He's only just signed the contract and I think the president made the announcement just before he signed it!" He added: "I'm sure he would love his new team to play England and, if that was the case, he would only have one thought: to get the win. "It would also mean that he would have got the Ivory Coast out of the 'group of death' with Portugal, Brazil and North Korea. After what happened to him with England, I am sure he would like nothing better than revenge over both Portugal and Brazil." In an official statement, the federation said: "Aware of the great expectations of our population who have taken a keen interest in the matter, the executive committee focused its choice on Mr Sven-Goran Eriksson. "The Swede has been, among others, coach of England and Mexico. He is an experienced technician who has been proven. "His mission is to lead our team during this World Cup, and to ensure that there is an honourable participation in a competition reserved for the top 32 football nations in the world, and it obviously will be difficult. "Therefore, the executive committee of the FIF appeals to the sacred union between the Elephants and their coach." It was reported this week that Eriksson was on a three-man shortlist for the role along with former Manchester City boss Mark Hughes and former Real Madrid coach Bernd Schuster. Eriksson led England from 2001 to 2006 and managed the team at three major tournaments, reaching the quarter-finals at the 2002 and 2006 World Cups as well as Euro 2004. More recently, he took charge of Mexico during the World Cup 2010 qualifiers but left the position after disappointing results. At club level, he has managed sides such as Benfica, Roma, Fiorentina, Lazio and Manchester City, and has won trophies including the UEFA Cup, Cup Winners' Cup and Serie A.
OFC has condemned the actions of a group of spectators who stormed the field at Municipal Stadium in Port Vila on Saturday shortly before the final whistle of the Tafea FC vs. Lautoka O-League match. Reports out of Port Vila suggest that a number of the 3000 spectators ran onto the playing pitch following Lautoka’s third goal in the 86th minute, forcing local officials to end the match prematurely. OFC General Secretary Tai Nicholas says that an investigation will be opened into the matter. “There was a security breach shortly before the final whistle where spectators ran onto the field of play. Regretfully, there were also reports of physical altercations between spectators, players and match officials but we can confirm that match officials and players are safe,” said Nicholas. The Group B match ended 3-1 in favour of the visiting Lautoka side. 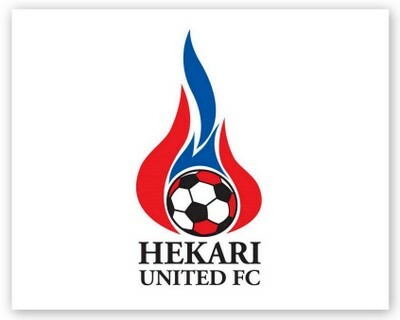 Meanwhile Hekari United FC beat Marist 4-1 in Honiara to claim top spot in the group, finishing one point clear of Lautoka, and will progress to the 2010 O-League Final. Harry Atisson who has been promoting football in the country in recent years was disappointed over the actions of football fans yesterday at the PVM Stadium. Atisson was seen with tears on the national TV during the live coverage of the match between Tafea and Lautoka at the PVM Stadium yesterday afternoon. "My efforts and those who are promoting football in the country are wasted", he said. "My efforts and those who are promoting football in the country are wasted"
The O-League match between Tafea F.C. and Lautoka F.C. was interrupted by Tafea supporters who stormed the pitch over the FIFA referee's decisions on the Tafea's side. When asked about his opinion as a referee development officer and OFC/FIFA referee committee member over the incident, Atisson said "FIFA referee, Michael Hester understood the game and what he did was right". "The referee applied the laws of the game, and mistakes too can happen anywhere in the world, yet you don't see supporters attacking the referees", he said. 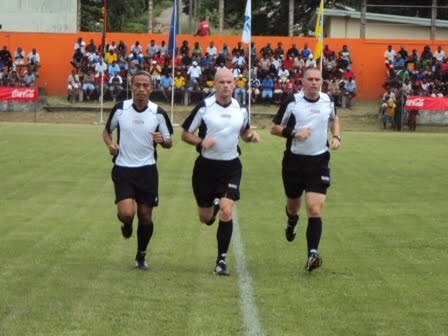 The referees that officiated yesterday's match were selected by OFC referee committee which Atisson is part of, as an exercise to prepare them to participate in the 2010 World Cup in South Africa. "Those were my referees and they have reached the U17 World Cup semi-finals last year in Nigeria. We should be proud of them because they represent Oceania and are of high and international standard. They applied every laws during the match and you could tell the difference with local referees", he said. "I am terribly sorry for what happened. The President of the Republic of Vanuatu and the president of Vanuatu Football Federation were there", said Atisson. "It's a shame, while we are trying our best to take football to another level, some ignorant are trying to paint a bad picture about us", he added. According to Atisson, the actions could cause Vanuatu to loose some opportunities at the OFC and FIFA level. Tafea and Lautoka's clashed yesterday was interrupted when Tafea supporters stormed in the pitch overruling the referee’s authority by stopping the game before the final whistle. The incident was sparked 87 minutes in the game when an angry fan ran in and tackled FIFA referee, Michael Hester down for flagging his 2nd red card to Tafea’s Geoffrey Gete over a bad tackle. 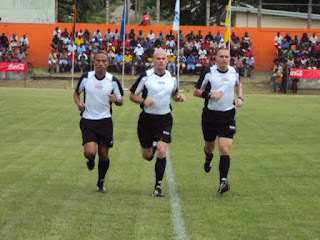 Retired referee, Mr. Harry Atisson who has been a referee for the last 20 years, and is a member of the Oceania and FIFA referee committee said “In the laws of the game, a player is disciplined according to the nature of the offense. In Tafea’s case, a bad tackle from behind is a direct red card”. But, it is unclear, what the intention of those who stormed the pitch later on after Michael Hester’s actions, because not only the referee who got hurt, but the Lautoka F.C. players run for their lives too and one player was badly injured. It is obvious that the supporters who got in the pitch were Tafea F.C. die-hard fans, and either they got in because they were unhappy over the referee’s decisions or because Tafea was losing. They took the pitch and outnumbered the securities who look helpless in controlling the situation, but with the help of some fans and football officials, they sheltered Michael Hester and his assistants from the worst could happen. It was unfortunate for Lautoka players and official when they remain unprotected and one player got badly injured and few got punched and kicked by the angry mobs. Moses Stevens who is the President of Pacific Island News Association and is a well-known football commentator for the last 15 years said “This is a sad day for Vanuatu football. I have never seen a scene like this during my career”. It is also wrong to see securities that have been posted to protect the match have also got involved in the brawl. Vanuafoot contacted a representative of the stadium management, Mr. Bong Shem with regards to security, and Bong said they were informed of the securities involvement. "It is shocking to hear about some of the securities actions. We will review their contract and this could be the end of their service here", said Mr. Shem. Meanwhile, Michael Hester and his assistants and a Lautoka player went for medical treatment and check-up after the incident yesterday afternoon. The referee’s and VFF report will be submitted to OFC disciplinary committee later on the week for their consideration. 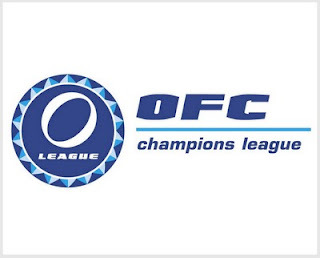 It is possible that OFC will levy tough disciplinary sanctions to Vanuatu over the incident. 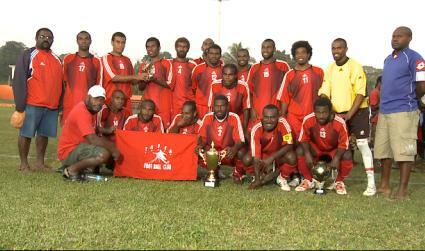 Photo: Lautoka F.C. team escorted out by Police. Labels: Lautoka F.C., Regional News, Tafea F.C. TAFEA F.C. Vs LAUTOKA F.C. - LIVE Now! TAFEA F.C. Vs LAUTOKA F.C. match stopped by supporters. [commentator]Tafea needs to be carefull in the defence. [commentator] 21 minutes no goals, both team putting a lot of effort. [commentator] Nawatu creating a lot of opportunities for Lautoka. [commentator] Another good opportunity for Lautoka again was missed. [commentator] 1st goal for Lautoka. Long distance ball from Samuela Vula. TAFEA F.C. 0 - 1 LAUTOKA F.C. [commentator] Expect change on Tafea's side in the 2nd half. Frazer on the bench too. [o-league] who scored the first goal? Goals: Samuela Vula 25', Jone Vono 51', Geoffery Gete 57'. [commentator] 75' Substitution for Lautoka. Nawatu 7 out Sailesh Samy 11 In. [commentator] 78' Good crossing by Jean Nako to Richard and left shot taken but it hit the goal post. Tafea having more opportunities. [commentator] 81' Fredy Vava [TAF] and Vula [LAU] booked. Corner free kick pushed out by Tafea GK. 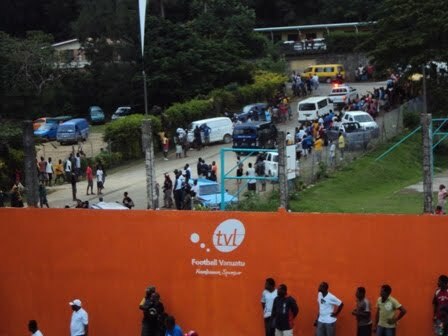 [commentator] Tafea supporters stormed in and close the match. to put on a good show for our Vanuatu people", he added. impress in front of All Whites management. off at 3:00pm on Sunday at Kiwitea Street in Sandringham. up with another good performance. striker, says he doesn't mind where he plays this Sunday. be a good test of my abilities." last All Whites match through suspension. think too much about who is watching from the sideline. Hamilton-based defender who has five caps for New Zealand. motivation to improve his game. like to say I'm close to hitting my best form." coming on Sunday," said Emblen. CAMPBELL, 5. Matt WILLIAMS, 6. Ki-Hyung LEE, 7. James PRITCHETT, 8. VRIES, 21. Jack PELTER, 22. Liam LITTLE [GK], 24. Luke ADAMS. Michel Platini has confirmed he is to seek a second term as UEFA president next year. Platini, who defeated Lennart Johansson in the elections for the role in January 2007, told the XXXIV Ordinary UEFA Congress in Tel Aviv that he is eager to continue his work. "I am a happy man, a happy president and happy to work with you," he said. "There is more work to do in the future so I am happy to announce to you that I am a candidate for re-election to the presidency of UEFA." It had been suggested that Platini may stand for FIFA president, but he has confirmed that he remains committed to seeing through the four major challenges he had identified at the previous year's congress in Copenhagen. He had indicated a willingness to ensure that Euro 2012 takes place in Poland and the Ukraine, ensure there is 'financial fair play' in the sport, to halt the traffic of minors and stamp out illegal betting fraud. Many of Europe's top clubs will be affected by changes demanding financial fair play, which would have ramifications for many Champions League and Europa League sides from 2012. "I told you, word for word, that in this area we will act because it is a question of ethics, a question of credibility and even a question of survival for our sport," Platini told the congress. "I can tell you today that we have acted. "We have acted because, since Copenhagen, all the families of football, without exception, have approved our concept and the principles of financial fair play. Principles that are supported and encouraged by the institutions of the European Union. 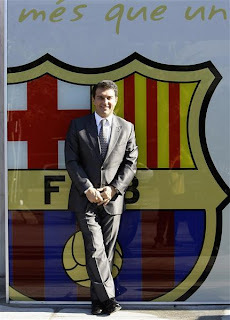 "A Uefa Club Financial Control Panel has been set up, involving some of the top European experts on these issues ... It is now established that, from the 2012-13 season, clubs participating in European competitions will have to follow a simple but demanding rule: they will not be allowed to spend more than they earn. "Today, thanks to this set of decisions on financial fair play, and especially in view of the reaction of all members of the football family to these measures, it is clear that football has matured." 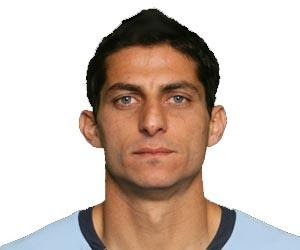 Sydney FC defender Simon Colosimo. said that no deal has been done. the World Cup so he could press for selection for Pim Verbeek's squad. OFC has shown its commitment to promoting social inclusion by signing an MOU with Special Olympics Asia Pacific (SOAP), through its parent body Special Olympics International at the weekend. The signing ceremony took place in the presence of Ministers of Sport from 11 Pacific Island nations who were hosted by OFC at the TelstraClear Pacific Centre in Manukau during the inaugural Pacific Youth and Sports Conference 2010. OFC President Reynald Temarii says he sees symmetry in the values, goals and aims of OFC and Special Olympics. "Themes of the Pacific Youth and Sports Conference included social integration and anti-discrimination so it makes sense that we use this occasion to sign an MOU with Special Olympics," said President Temarii. SOAP Chairman David Rutherford says he is looking forward to developing a long-term relationship with OFC. “What strikes me about OFC is they say the right things but also do the right things - when you look at a grassroots development programme like ‘Just Play’, it brings that to life,” said Rutherford, former CEO of New Zealand Rugby. "Special Olympics have a mission to grow the number of footballers - we have our Special Olympics Global Football, FIFA, Tottenham Hotspur, Inter Milan, New Zealand Football, Corinthians (Brazil), Kaka and a growing number of clubs." In 2007, Special Olympics developed a pilot project with FIFA aimed at using the sport of football and the capacity of both organisations to build awareness and understanding for people with intellectual disabilities. Through expanding opportunities for football participation, individual empowerment, family education and basic health screening through the global Special Olympics Healthy Athletes Programme, the strength of this partnership and pilot programme significantly impacted life both on and off the football field. "It is recognised that the pilot programme between FIFA and Special Olympics has been very successful and that the way forward for athlete growth and opportunity will be based upon the strength of partnership development where mutual synergies exist," said President Temarii. In mid 2009, OFC and SOAP began discussions to develop a partnership to reinforce sustainable youth development in the Pacific region through sports. The catalyst for the early engagement centered around an OFC initiative to stage the first ever Pacific Youth and Sports Conference. Coupled with this was the availability of financial support through the Australian Government and the direct investment that OFC had made into sports facilities, equipment and youth development in many of the Pacific rim communities. 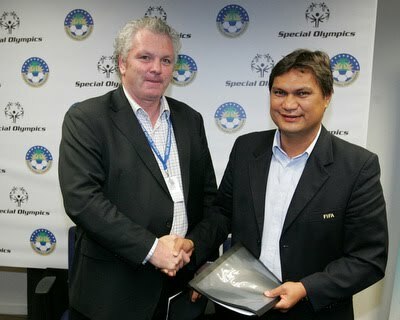 The strength of Special Olympics global sports resources also added strength to the proposed partnership. Special Olympics have developed community level sports resources in over 30 sports and have supported an additional two million more Special Olympics athletes in just four years. That is a tripling of the number of Special Olympics athletes in the world. This agreement allows the sharing of these resources more widely for the benefit of community sport. Special Olympics New Zealand was approached to lead the dialogue with OFC and to develop partnership opportunities for the Special Olympics Asia Pacific region. It became clear that the existing Football for Hope programme that was already established between FIFA and Special Olympics International could provide a framework for the OFC/Special Olympics Asia Pacific programme development.